That the phrase "the laws of Hawaii," as used in this Act without qualifying words, shall mean the constitution and laws of the Republic of Hawaii, in force on the twelfth day of August, eighteen hundred and ninety-eight, at the time of the transfer of the sovereignty of the Hawaiian Islands to the United States of America. The constitution and statute laws of the Republic of Hawaii then in force, set forth in a compilation made by Sidney M. Ballou under the authority of the legislature, and published in two volumes entitled "Civil Laws" and "Penal Laws," respectively, and in the Session Laws of the Legislature for the session of eighteen hundred and ninety-eight, are referred to in this Act as "Civil Laws," "Penal Laws," and "Session Laws." Historical note. - This is the Act, as since amended, of April 30, 1900, c. 339, 31 Stat. 141 (2 Supp. R.S. 1141), prepared and recommended by a commission appointed by the President under the Joint Resolution of Annexation of July 7, 1898, 30 Stat. 750 (2 Supp. R.S. 895). The formal transfer of sovereignty under that resolution took place Aug. 12, 1898, and this Organic Act, creating the Territory, took effect June 14, 1900. See Joint Resolution RLH 1955, page 13, with notes thereto, for application of Federal Constitution and laws to Hawaii between annexation and establishment of territorial government. For decisions under this Organic Act, see notes to sections thereof. For note relating to act of Congress, presidential proclamations, and executive orders, see the Chronological Note, RLH 1955, page 9. The volumes mentioned in the second paragraph of this section did not contain all the laws then in force referred to in the first paragraph, nor were all the laws therein contained then in force. The Civil Laws and Penal Laws were compilations, not enacted by thelegislature. These laws were in general continued in force by Congress with certain exceptions and modifications. See §§ 6, 7 of the Organic Act. See also, as to continuation of Hawaiian laws, notes to other sections of the Organic Act, and to Joint Resolution of Annexation, RLH 1955, page 13. Cited in Ex parte Wilder's S.S. Co., 183 U.S. 545, 22 S. Ct. 225, 46 L. Ed. 321 (1902); United States v. Yii, 3 U.S.D.C. Haw. 87 (1906); Cooke v. Thayer, 22 Haw. 247 (1914); Mookini v. United States, 303 U.S. 201, 58 S. Ct. 543, 82 L. Ed. 748 (1938); Inter-Island Steam Nav. Co. v. Hawaii, 305 U.S. 306, 59 S. Ct. 202, 83 L. Ed. 189 (1938); Bishop v. Kalua, 36 Haw. 164 (1942); Zimmerman v. Poindexter, 78 F. Supp. 421 (D. Haw. 1947); Kam Koon Wan v. E.E. Black, Ltd., 75 F. Supp. 553 (D. Haw. 1948); Reinecke v. Loper, 77 F. Supp. 333 (D. Haw. 1948); Dyer v. Abe, 138 F. Supp. 220 (D. Haw. 1956); United States v. Coins, 144 F. Supp. 740 (D. Haw. 1956); United States v. Gertz, 249 F.2d 662 (9th Cir. 1957); O'Daniel v. Inter-Island Resorts, Ltd., 46 Haw. 197, 377 P.2d 609 (1962); Burns v. Richardson, 384 U.S. 73, 86 S. Ct. 1286, 16 L. Ed. 2d 376 (1966); Robinson v. Ariyoshi, 441 F. Supp. 559 (D. Haw. 1977). University of Hawaii Law Review. Comment, State-Federal Jurisdictional Conflict over the Internal Waters and Submerged Lands of the Northwestern Hawaiian Islands, 4 U. Haw. L. Rev. 139 (1982). § 2. Territory of Hawaii. That the islands acquired by the United States of America under an Act of Congress entitled "Joint resolution to provide for annexing the Hawaiian Islands to the United States," approved July seventh, eighteen hundred and ninety-eight, shall be known as the Territory of Hawaii. Historical note. - The Hawaiian group consists of the following islands: Hawaii, Maui, Oahu, Kauai, Molokai, Lanai, Niihau, Kahoolawe, Molokini, Lehua, Kaula, Nihoa, Necker, Laysan, Gardiner, Lisiansky, Ocean, French Frigates Shoal, Palmyra, Brooks Shoal, Pearl and Hermes Reef, Gambia Shoal and Dowsett and Maro Reef. The first nineteen were listed in the Commission report transmitted to Congress by the message of the President, Senate Doc. 16, 55th Congress, 3d Session, 1898. U.S. Misc. Pub. 1898. It has been a question whether Midway was acquired by Hawaii on July 5, 1859, and so is a part of the Territory, or was acquired by the United States independently on August 28, 1867; the latter was assumed in 182 U.S. 304. See the 1933 report of the Hawaiian Historical Society, paper read by P. C. Morris, Dec. 14, 1933. It was assumed by Congress that Midway was not part of the Territory in the Act of August 13, 1940, c. 662, 54 Stat. 784, extending jurisdiction of United States District Court for Hawaii to include Midway Islands, also Wake, Johnston, Sand, and Jarvis Islands. 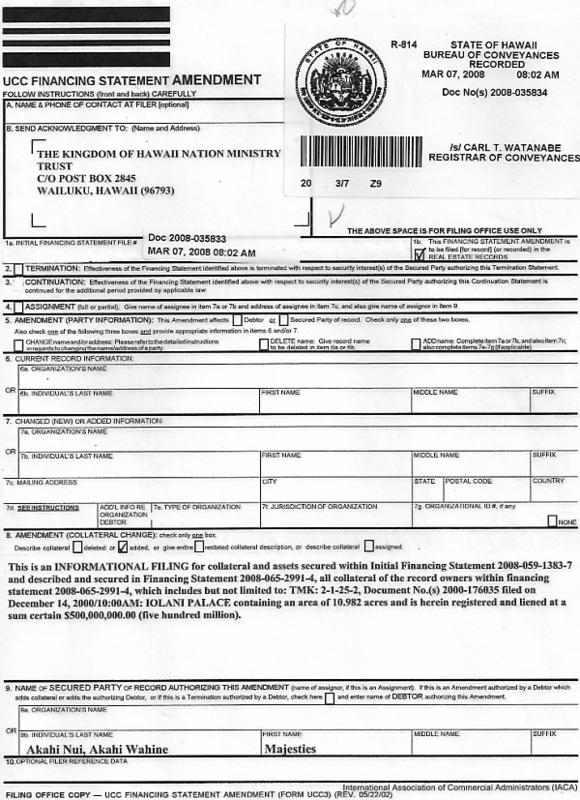 Territorial jurisdiction includes the military and naval reservations within the exterior boundaries of the Territory. By the Act of April 19, 1930, the Hawaii National Park was removed from territorial jurisdiction except for certain purposes therein stated. For discussion of title to Palmyra Island, see United States v. Fullard-Leo, 133 F.2d 743 (9th Cir. ), cert. denied, 319 U.S. 748, 63 S. Ct. 1157, 87 L. Ed. 1703 (1943); United States v. Fullard-Leo, 156 F.2d 756 (9th Cir. 1946), aff 'd, 331 U.S. 256, 67 S. Ct. 1287, 91 L. Ed. 1474 (1947). Cited in In re Loucks, 13 Haw. 17 (1900); Ex parte Wilder's S.S. Co., 183 U.S. 545, 22 S. Ct. 225, 46 L. Ed. 321 (1902); Bishop v. Mahiko, 35 Haw. 608 (1940); Civil Aeronautics Bd. v. Island Airlines, 235 F. Supp. 990 (D. Haw. 1964). § 3. Government of the Territory of Hawaii. That a Territorial government is hereby established over the said Territory, with its capital at Honolulu, on the island of Oahu. Historical note. - By this Act Hawaii acquired the status of an incorporated Territory and became an integral part of the United States. On the status of Hawaii between annexation and the establishment of territorial government, see note to Joint Resolution of Annexation, RLH 1955, page 13. Cited in In re Loucks, 13 Haw. 17 (1900). That all persons who were citizens of the Republic of Hawaii on August twelfth, eighteen hundred and ninety-eight, are hereby declared to be citizens of the United States and citizens of the Territory of Hawaii. And all citizens of the United States resident in the Hawaiian Islands who were resident there on or since August twelfth, eighteen hundred and ninety-eight and all the citizens of the United States who shall hereafter reside in the Territory of Hawaii for one year shall be citizens of the Territory of Hawaii. Historical note. - This section was supplemented by the Act of July 2, 1932, 47 Stat. 571, amended by the Act of July 1, 1940, 54 Stat. 707, providing that for purposes of the Act of Sept. 22, 1922, 46 Stat. 1511, women born in Hawaii prior to June 14, 1900, were deemed U.S. citizens at birth. But the Act of Sept. 22, 1922 was repealed by the Act of Oct. 14, 1940, 54 Stat. 1137, which in turn was repealed by the Act of June 27, 1952, 66 Stat. 166 (the McCarran-Walter Act), and the present provisions are contained in 8 U.S.C. § 1435(a). Under art. 17, § 1, of the Const. of 1894 (adapted from the 14th Am. of the U.S. Const.) all persons born or naturalized in the Hawaiian islands and subject to the jurisdiction of the Republic of Hawaii were citizens thereof. Between 1842 and 1892, 731 Chinese persons and three Japanese persons were naturalized in Hawaii. The secretary of Hawaii may issue to persons born in Hawaii certificates of Hawaiian birth, which are prima facie evidence. See §§ 338-41 to 44. See also former law: L. 1905, c. 64; am. L. 1907, c. 79; rep. L. 1909, c. 15; R.L. 1915, p. 1487; R.L. 1925, c. 21; R.L. 1935, c. 247. See also §§ 100 and 101 of the Organic Act. Also see the note to Joint Resolution of annexation, RLH 1955, page 13. Citizenship extended to persons born in Hawaiian Islands. - A person born in the Hawaiian Islands of British parents domiciled in this country is subject to the jurisdiction of this country and is a Hawaiian subject or citizen. In re Macfarlane, 11 Haw. 166 (1897). The framers of the Act of Congress providing a government for the Territory of Hawaii approved April 30, 1900, intended to refer to the geographical limits of the Hawaiian Islands rather than to any political conditions existing therein; and that the Hawaiian and American citizenship was to be extended to all persons born in the Islands, excepting only those born of persons engaged in the diplomatic service of foreign governments, such as ministers and ambassadors, whose residence by a fiction of public law is regarded as the place of their own country. United States v. Sai, 1 U.S.D.C. Haw. 118 (1901). The fact that two Chinese persons were born in the Hawaiian Islands while the same was a monarchy known as the Kingdom of Hawaii did not deprive them of their status as American citizens, it being proven that they were born in the Hawaiian Islands, sons of a domiciled Chinese laborer, in view of the provisions of Art. 17, § 1, of the Constitution of the Republic of Hawaii, and of the provisions of this section of the Act of Congress, approved April 30, 1900, to provide a government for the Territory of Hawaii, that all persons who were citizens of the Republic of Hawaii on August 12, 1898, were declared to be citizens of the United States and citizens of the Territory of Hawaii. United States v. Sai, 1 U.S.D.C. Haw. 118 (1901). Naturalization. - The circuit courts of the Territory had power to naturalize. Territory of Haw. v. Kaizo, 17 Haw. 295, aff 'd, 18 Haw. 28 (1906), aff 'd, 211 U.S. 146, 29 S. Ct. 41, 53 L. Ed. 125 (1908). Hawaiian citizenship by naturalization did not extend to the nonresident minor children of the persons so naturalized, nor were such children, while still nonresident, made citizens of the United States by the provision contained in this section. In re Ko, 3 U.S.D.C. Haw. 623 (1910). Deportation proceedings. - See United States v. Yong, 1 U.S.D.C. Haw. 104 (1901). Cited in In re Loucks, 13 Haw. 17 (1900); Ex parte Ah Oi, 13 Haw. 534 (1901); In re Sai, 1 U.S.D.C. Haw. 234 (1902); United States v. Dang Mew Wan Lum, 88 F.2d 88 (9th Cir. 1937); United States v. Rodiek, 117 F.2d 588 (2nd Cir. 1941); Wong Kam Wo v. Dulles, 236 F.2d 622 (9th Cir. 1956). § 5. United States Constitution. Historical note. - Federal liquor prohibition laws in effect in Hawaii were repealed by the Act of Mar. 26, 1934, c. 88, 48 Stat. 467. For application of other provisions of the federal Constitution and laws to Hawaii, see note to Joint Resolution of Annexation, RLH 1955, page 13. Section made federal law applicable in Hawaii. - This section provides that the Constitution and all laws of the United States which are not locally inapplicable shall have the same force and effect within Hawaii as elsewhere in the United States, with certain exceptions. United States v. Kee, 3 U.S.D.C. Haw. 262 (1908). This section makes effective in the Territory all the laws of the United States which are not locally applicable, saving only certain specified statutes. The special exceptions strengthen the general application of this statutory rule. United States v. Thurston, 4 U.S.D.C. Haw. 1 (1911). A territory must be considered in the same category as a state, and the Commerce Clause of the federal Constitution is applicable to such territory. Inter-Island Steam Nav. Co. v. Territory of Haw., 96 F.2d 412 (9th Cir. ), aff 'd, 305 U.S. 306, 59 S. Ct. 202, 83 L. Ed. 189 (1938). Where a territory is incorporated into the United States (as in the case of the Territory of Hawaii) the federal Constitution applies and becomes operative in such territory. Territory of Haw. v. Yoshimura, 35 Haw. 324 (1940). This section guarantees the fundamental rights of the Constitution to territorial citizens; it involves a national policy, the benefits of which the United States has accorded Hawaii. This section is a law giving rise to original jurisdiction of a United States district court, and pursuant to it, the court may adjudicate plaintiff's claims for the equal protection of the law arising from a statute of the United States. Dyer v. Abe, 138 F. Supp. 220 (D. Haw. 1956), rev'd on other grounds, 256 F.2d 728 (9th Cir. 1958). The equal protection of the law is guaranteed by the Organic Act of Hawaii. It is thus unnecessary to decide whether the Fourteenth Amendment applies directly to a territory; its protection to individual citizens does apply. Dyer v. Abe, 138 F. Supp. 220 (D. Haw. 1956), rev'd on other grounds, 256 F.2d 728 (9th Cir. 1958). Fundamental law of territory. - The Organic Act passed by Congress for the government of a territory, and under which the territorial government is organized, must be taken as the fundamental law of the territory; and all territorial legislative assemblies derive their force and validity from such organic acts. Achi v. Kapiolani Estate, Ltd., 1 U.S.D.C. Haw. 86 (1901). Cited in In re Loucks, 13 Haw. 17 (1900); In re Lin ex rel. Chong, 1 U.S.D.C. Haw. 44 (1900); Ex parte Ah Oi, 13 Haw. 534 (1901); Pringle v. Hilo Mercantile Co., 13 Haw. 705 (1901); Ex parte Wilder's S.S. Co., 183 U.S. 545, 22 S. Ct. 225, 46 L. Ed. 321 (1902); Hawaii v. Mankichi, 190 U.S. 197, 23 S. Ct. 787, 47 L. Ed. 1016 (1903); United States v. Moore, 3 U.S.D.C. Haw. 66 (1906); Robinson v. Baldwin, 19 Haw. 9 (1908); Territory of Haw. v. Martin, 19 Haw. 201 (1908); United States v. Perez, 3 U.S.D.C. Haw. 295 (1908); Wynne v. United States, 217 U.S. 234, 30 S. Ct. 447, 54 L. Ed. 748 (1910); United States v. Ishibashyi, 3 U.S.D.C. Haw. 517 (1910); Duncan v. Kahanamoku, 327 U.S. 304, 66 S. Ct. 606, 90 L. Ed. 688 (1946); United States v. Fullard-Leo, 331 U.S. 256, 67 S. Ct. 1287, 91 L. Ed. 1474 (1947); Robinson v. Ariyoshi, 441 F. Supp. 559 (D. Haw. 1977). Hawaii Bar Journal. Article, Hawaii's Legal System: A Brief Survey, 1 Haw. B.J. (March 1963, at 1). § 6. Laws of Hawaii. That the laws of Hawaii not inconsistent with the Constitution or laws of the United States or the provisions of this Act shall continue in force, subject to repeal or amendment by the legislature of Hawaii or the Congress of the United States. Historical note. - As to the meaning of "laws of Hawaii," see § 1 of the Organic Act and the note thereunder. Pursuant to § 73(c) of the Organic Act, certain land laws are not subject to repeal or amendment by legislature without the approval of Congress. Organic Act as fundamental law of territory. - The Organic Act passed by Congress for the government of a territory, and under which the territorial government is organized, must be taken as the fundamental law of the territory; and all territorial legislative assemblies derive their force and validity from such Organic Acts. Achi v. Kapiolani Estate, Ltd., 1 U.S.D.C. Haw. 86 (1901). Original Hawaiian statute defining manslaughter was not inconsistent with the Constitution or laws of the United States or provisions of the Organic Act, and was one of the laws continued in force pursuant to § 6 of the Organic Act. Territory of Haw. v. Braly, 29 Haw. 7 (1926). Unanimity of verdicts is essential under provisions of the Organic Act, but it may be waived, and it is waived by a request for an instruction, which is given, that a verdict may be rendered by nine jurors. Pringle v. Hilo Mercantile Co., 13 Haw. 705 (1901). Hawaiian laws not inconsistent with U.S. Constitution or Act remain in effect until changed. - This section, providing that the laws of Hawaii not inconsistent with the Constitution or laws of the United States or the provisions of the Organic Act should continue in force, subject to repeal or amendment by the legislature of Hawaii or the Congress of the United States, was significant of the complete recognition by the United States of the validity of such laws under the new status and of the agreement for their continuance until subject to further legislation relating to them either by Congress or by the Hawaiian legislature. United States v. Haleakala Ranch Co., 3 U.S.D.C. Haw. 299 (1908). Former statute relating to fornication held not inconsistent with any of the provisions of the Organic Act or the United States Constitution. Territory of Haw. v. Martin, 19 Haw. 201 (1908). Corporation chartered by Hawaiian monarchy not same as corporation organized by Congress and not forbidden from making contribution to political offices. 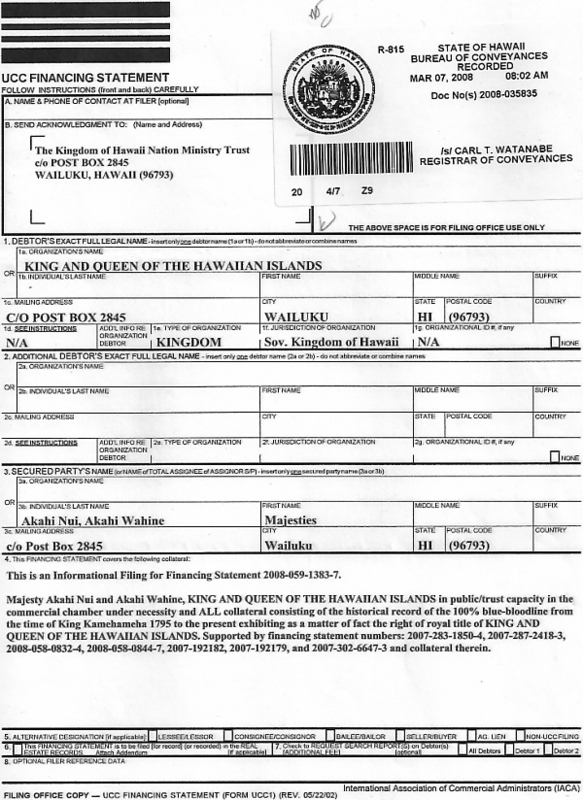 - An act of Congress forbidding any national bank or any corporation organized by authority of any laws of Congress from making a money contribution in connection with an election to political office was not applicable to a corporation chartered by the government of the Hawaiian monarchy. United States v. Haleakala Ranch Co., 3 U.S.D.C. Haw. 299 (1908). U. S. District Court for District of Hawaii had jurisdiction of an assault committed upon military reservation in the Territory of Hawaii. United States v. Motohara, 4 U.S.D.C. Haw. 62 (1911). The district court had jurisdiction of an assault and battery committed by a commander of the United States Navy on the naval reservation in Honolulu. Territory v. Carter, 19 Haw. 198 (1908). Right of appeal. - Although without statutory authority, the right of appeal to the circuit court for mitigation of sentence from district magistrates, and on exercise thereof the power of the circuit court to mitigate an excessive sentence of the district magistrate, were fixed by Hawaiian judicial precedent within the meaning of § 1-1, and therefore had the force of a statutory right and power under the laws of Hawaii within the meaning of this section. In re Marteles, 38 Haw. 479 (1950). Cited in Coffield v. Territory of Haw., 13 Haw. 478 (1901); Tomikawa v. Gama, 14 Haw. 431 (1902); Ex parte Wilder's S.S. Co., 183 U.S. 545, 22 S. Ct. 225, 46 L. Ed. 321 (1902); The Schooner Robert Lewers Co. v. Kekauoha, 114 Fed. 849 (9th Cir. 1902); In re Austin, 15 Haw. 114 (1903); In re Contested Election, 15 Haw. 323 (1903); Carter v. Gear, 197 U.S. 348, 25 S. Ct. 491, 49 L. Ed. 787 (1905); Kealoha v. Castle, 112 U.S. 238, 5 S. Ct. 131, 28 L. Ed. 684 (1884); Wynne v. United States, 217 U.S. 234, 30 S. Ct. 447, 54 L. Ed. 748 (1910); Territory of Haw. v. Ota, 36 Haw. 80 (1942); State v. Tin Yan, 44 Haw. 370, 355 P.2d 25 (1960); Robinson v. Ariyoshi, 441 F. Supp. 559 (D. Haw. 1977). Civil Laws: Sections two and three, Promulgation of laws; chapter five, Flag and seal; sections thirty to thirty-three, inclusive, Tenders for supplies; chapter seven, Minister of Foreign Affairs; chapter eight, Diplomatic and consular agents; section one hundred and thirty-four and one hundred and thirty-five, National museum; chapter twelve, Education of Hawaiian youths abroad; sections one hundred and fifty to one hundred and fifty-six, inclusive, Aid to board of education; chapter fourteen, Minister of the Interior; sections one hundred and sixty-six to one hundred and sixty-eight, inclusive, one hundred and seventy-four and one hundred and seventy-five, Government lands; section one hundred and ninety, Board of commissioners of public lands; section four hundred and twenty-four, Bureau of agriculture and forestry; chapter thirty-one, Agriculture and manufactures; chapter thirty-two, Ramie; chapter thirty-three, Taro flour; chapter thirty-four, Development of resources; chapter thirty-five, Agriculture; section four hundred and seventy-seven, Brands; chapter thirty-seven, Patents; chapter thirty-eight, Copyrights; sections five hundred and fifty-six and five hundred and fifty-seven, Railroad subsidy; chapter forty-seven, Pacific cable; chapter forty-eight, Hospitals; chapter fifty-one, Coins and currency; chapter fifty-four, Consolidation of public debt; chapter fifty-six, Post-office; chapter fifty-seven, Exemptions from postage; chapter fifty-eight, Postal savings banks; chapter sixty-five, Import duties; chapter sixty-six, Imports; chapter sixty-seven, Ports of entry and collection districts; chapter sixty-eight, Collectors; chapter sixty-nine, Registry of vessels; section one thousand and eleven, Customs-house charges; section eleven hundred and two, Elections; section eleven hundred and thirty-two, Appointment of magistrate; last clause of first subdivision and fifth subdivision of section eleven hundred and forty-four, first subdivision of section eleven hundred and forty-five, Jurisdiction; sections eleven hundred and seventy-three to eleven hundred and seventy-eight, inclusive, Translation of decisions; section eleven hundred and eighty-eight, Clerks of court; sections thirteen hundred and twenty-nine, thirteen hundred and thirty-one, thirteen hundred and thirty-two, thirteen hundred and forty-seven to thirteen hundred and fifty-four, inclusive, Juries; sections fifteen hundred and nine to fifteen hundred and fourteen, inclusive, Maritime matters; chapter one hundred and two, Naturalization; section sixteen hundred and seventy-eight, Habeas corpus; chapter one hundred and eight, Arrest of debtors; subdivisions six, seven, ten, twelve to fourteen of section seventeen hundred and thirty-six, Garnishment; sections seventeen hundred and fifty-five to seventeen hundred and fifty-eight, inclusive, Liens on vessels; chapter one hundred and sixteen, Bankruptcy, and sections eighteen hundred and twenty-eight to eighteen hundred and thirty-two, inclusive, Water rights. Penal Laws: Chapter six, Treason; sections sixty-five to sixty-seven, inclusive, Foot binding; chapter seventeen, Violation of postal laws; section three hundred and fourteen, Blasphemy; sections three hundred and seventy-one to three hundred and seventy-two, inclusive, Vagrants; sections four hundred and eleven to four hundred and thirteen, inclusive, Manufacture of liquors; chapter forty-three, Offenses on the high seas and other waters; sections five hundred and ninety-five and six hundred and two to six hundred and five, inclusive, Jurisdiction; section six hundred and twenty-three, Procedure; sections seven hundred and seven hundred and one, Imports; section seven hundred and fifteen, Auction license; section seven hundred and forty-five, Commercial travelers; sections seven hundred and forty-eight to seven hundred and fifty-five, inclusive, Firearms; sections seven hundred and ninety-six to eight hundred and nine, inclusive, Coasting trade; sections eight hundred and eleven and eight hundred and twelve, Peddling foreign goods; sections eight hundred and thirteen to eight hundred and fifteen, inclusive, Importation of livestock; section eight hundred and nineteen, Imports; sections eight hundred and eighty-six to nine hundred and six, inclusive, Quarantine; section eleven hundred and thirty-seven, Consuls and consular agents; chapter sixty-seven, Whale ships; sections eleven hundred and forty-five to eleven hundred and seventy-nine, inclusive, and twelve hundred and four to twelve hundred and nine, inclusive, Arrival, entry and departure of vessels; chapters sixty-nine to seventy-six, inclusive, Navigation and other matters within the exclusive jurisdiction of the United States; sections thirteen hundred and forty-seven and thirteen hundred and forty-eight, Fraudulent exportation; chapter seventy-eight, Masters and servants; chapter ninety-three, Immigration; sections sixteen hundred and one, sixteen hundred and eight, and sixteen hundred and twelve, Agriculture and forestry; chapter ninety-six, Seditious offenses; and chapter ninety-nine, Sailing regulations. Organic Act is fundamental law of territory. - The Organic Act passed by Congress for the government of a territory, and under which the territorial government is organized, must be taken as the fundamental law of the territory; and all territorial legislative assemblies derive their force and validity from such Organic Acts. Achi v. Kapiolani Estate, Ltd., 1 U.S.D.C. Haw. 86 (1901). Writ of ne exeat was not available, in an action of assumpsit, to prevent a defendant from going away from the Territory or to compel him to give security for the payment of the judgment that might be recovered. The execution of the writ would subject the defendant to imprisonment for debt, contrary to the provisions of the Organic Act. Oahu Lumber & Bldg. Co. v. Ding Sing, 15 Haw. 412 (1904). Cited in Ex parte Wilder's S.S. Co., 183 U.S. 545, 22 S. Ct. 225, 46 L. Ed. 321 (1902); Territory of Haw. v. Ng Kow, 15 Haw. 602 (1904); Carter v. Gear, 197 U.S. 348, 25 S. Ct. 491 (1905); Territory of Haw. v. Martin, 19 Haw. 201 (1908); Wynne v. United States, 217 U.S. 234, 30 S. Ct. 447, 54 L. Ed. 748 (1910); Territory of Haw. v. Ota, 36 Haw. 80 (1942); State v. Jones, 45 Haw. 247, 365 P.2d 460 (1961); Robinson v. Ariyoshi, 441 F. Supp. 559 (D. Haw. 1977). § 8. Certain offices abolished. 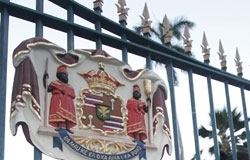 That the offices of President, minister of foreign affairs, minister of the interior, minister of finance, minister of public instruction, auditor-general, deputy auditor-general, surveyor-general, marshal, and deputy marshal of the Republic of Hawaii are hereby abolished. Cited in Fugihara Oriemon v. Territory of Haw., 13 Haw. 413 (1901); In re Austin, 15 Haw. 114 (1903); Ninomiya v. Kepoikai, 15 Haw. 273 (1903). § 9. Amendment of official titles. That wherever the words "President of the Republic of Hawaii," or "Republic of Hawaii," or "Government of the Republic of Hawaii," or their equivalents, occur in the laws of Hawaii not repealed by this Act, they are hereby amended to read "Governor of the Territory of Hawaii," or "Territory of Hawaii," or "Government of the Territory of Hawaii," or their equivalents, as the context requires. Cited in Fugihara Oriemon v. Territory of Haw., 13 Haw. 413 (1901). § 10. Construction of existing statutes. That all rights of action, suits at law and in equity, prosecutions, and judgments existing prior to the taking effect of this Act shall continue to be as effectual as if this Act had not been passed; and those in favor of or against the Republic of Hawaii, and not assumed by or transferred to the United States, shall be equally valid in favor of or against the government of the Territory of Hawaii. All offenses which by statute then in force were punishable as offenses against the Republic of Hawaii shall be punishable as offenses against the government of the Territory of Hawaii, unless such statute is inconsistent with this Act, or shall be repealed or changed by law. No person shall be subject to imprisonment for nonpayment of taxes nor for debt. All criminal and penal proceedings then pending in the courts of the Republic of Hawaii shall be prosecuted to final judgment and execution in the name of the Territory of Hawaii; all such proceedings, all actions at law, suits in equity, and other proceedings then pending in the courts of the Republic of Hawaii shall be carried on to final judgment and execution in the corresponding courts of the Territory of Hawaii; and all process issued and sentences imposed before this Act takes effect shall be as valid as if issued or imposed in the name of the Territory of Hawaii: Provided, That no suit or proceedings shall be maintained for the specific performance of any contract heretofore or hereafter entered into for personal labor or service, nor shall any remedy exist or be enforced for breach of any such contract, except in a civil suit or proceeding instituted solely to recover damages for such breach: Provided further, That the provisions of this section shall not modify or change the laws of the United States applicable to merchant seamen. 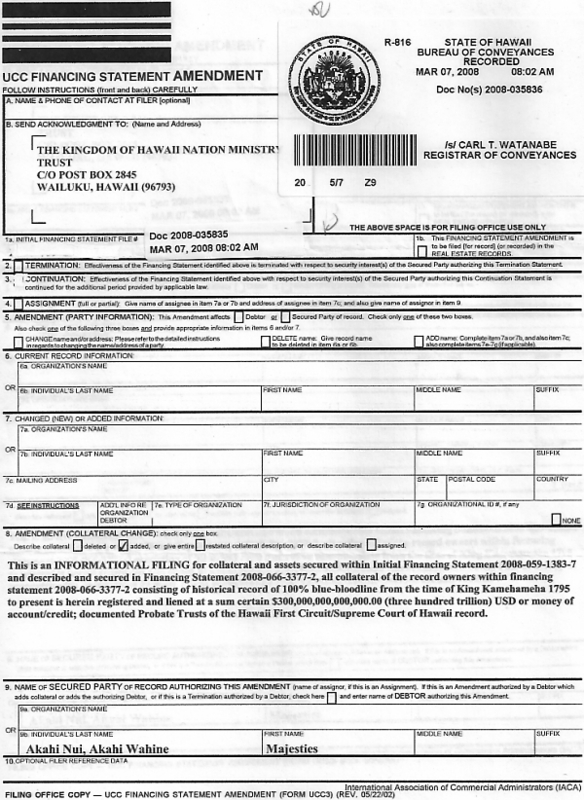 That all contracts made since August twelfth, eighteen hundred and ninety-eight, by which persons are held for service for a definite term, are hereby declared null and void and terminated, and no law shall be passed to enforce said contracts in any way; and it shall be the duty of the United States marshal to at once notify such persons so held of the termination of their contracts. Historical note. - On contract labor laws, see note to Joint Resolution of Annexation, RLH 1955, page 13. Writ of ne exeat was available, in an action of assumpsit, to prevent a defendant from going away from the Territory or to compel him to give security for the payment of the judgment that might be recovered. The execution of the writ would subject the defendant to imprisonment for debt, contrary to the provisions of the Organic Act. Oahu Lumber & Bldg. Co. v. Ding Sing, 15 Haw. 412 (1904). Probate judge's power to compel administrator to perform trust not within prohibition against imprisonment for debt. - The statutory power of a judge in probate to compel an administrator to perform his trusts and to account in all respects for the discharge of his official duties is the same as the compulsory power of equity to enforce its decrees and is not within the prohibition against imprisonment for debt. In re Estate of Ahi, 19 Haw. 232 (1908) (decided under prior law). Pending admiralty case heard in Hawaiian court. - Appeal in admiralty was one of the other proceedings then pending in the courts of the Republic of Hawaii which were to be carried on to final judgment and execution in the corresponding courts of the Territory of Hawaii, even though admiralty cases brought after the effective date of the Organic Act would have to be brought in the federal district court, subject to the right of appeal to the Circuit Court of Appeals for the Ninth Circuit. Ex parte Wilder's S.S. Co., 183 U.S. 545, 22 S. Ct. 225, 46 L. Ed. 321 (1902). This section had no application to stipulation in contract wherein defendant agreed not to exhibit or deal in motion picture films in Hawaii. Consolidated Amusement Co. v. Hughes, 22 Haw. 550 (1915). Cited in Hind v. Wilder's S.S. Co., 13 Haw. 174 (1900); Carter v. Gear, 197 U.S. 348, 25 S. Ct. 491, 49 L. Ed. 787 (1905); Kunewa v. Kaanaana, 18 Haw. 252 (1907); Honolulu Athletic Park v. Lowry, 22 Haw. 585 (1915); Honolulu Athletic Park v. Lowry, 22 Haw. 733 (1915); Rawlins v. Izumo Taisha Kyo Mission, 36 Haw. 721 (1944); Robinson v. Ariyoshi, 441 F. Supp. 559 (D. Haw. 1977). § 11. Style of process. That the style of all process in the Territorial courts shall hereafter run in the name of "The Territory of Hawaii," and all prosecutions shall be carried on in the name and by the authority of the Territory of Hawaii. Jurisdiction over violations of Prohibition Act. - In conferring jurisdiction over violations of the Prohibition Act on the courts of the Territory, Congress must clearly have intended that that jurisdiction should be exercised by the appropriate courts of the Territory in the usual manner in which similar jurisdiction is exercised by them and with the machinery at their command. In re Abreu, 27 Haw. 237 (1923); Territory v. Kitahara, 27 Haw. 397 (1923); Territory v. Higashiguchi, 27 Haw. 399 (1923). Cited in Territory ex rel. County of Oahu v. Whitney, 17 Haw. 174 (1905). Historical note. - Chapter II of this act (§§ 12 to 62), excepting § 15, was taken, with some modifications, from the Constitution of 1894. See also, RL 1905, p. 51, and RL 1915, p. 29. § 12. The legislative power. That the legislature of the Territory of Hawaii shall consist of two houses, styled, respectively, the senate and house of representatives, which shall organize and sit separately, except as otherwise herein provided. The two houses shall be styled "The legislature of the Territory of Hawaii." Clerk of the house of representatives was an "officer" within the meaning of Section 5408, Revised Statutes of the United States, which prohibited officers having custody of records, etc., from fraudulently taking away, withdrawing, or destroying any such record. United States v. Meheula, 2 U.S.D.C. Haw. 18 (1904). Settlement of legal or moral obligation for the courts and not the legislature. - Where the facts out of which either a legal or a moral obligation is claimed to arise are disputed, the settlement of the contention is not a rightful subject of legislation, but falls within the province of the courts. De Mello v. Fong, 164 F.2d 232 (9th Cir. 1947). Cited in De Mello v. Fong, 37 Haw. 415 (1946). That no person shall sit as a senator or representative in the legislature unless elected under and in conformity with this Act. Cited in Cooke v. Thayer, 22 Haw. 247 (1914). That a general election shall be held on the Tuesday next after the first Monday in November, nineteen hundred, and every second year thereafter: Provided, however, That the governor may in his discretion, on thirty days' notice, order a special election before the first general election, if, in his opinion, the public interests shall require a special session of the legislature. Cross References. - As to election of delegate, see § 85. Authorizing legislature to alter or amend election laws not authorization to provide for election of members. - Section 85 of the Organic Act, as amended June 28, 1906, authorizing the legislature of the Territory to alter or amend the election laws of the Territory, did not authorize the legislature to provide by statute for the election of members of the legislature at a time other than that fixed by this section for the holding of general elections. Cooke v. Thayer, 22 Haw. 247 (1914). Cited in Fairchild v. Smith, 15 Haw. 265 (1903); Lane v. Fern, 20 Haw. 290 (1910). 15. Each house judge of qualifications of members. That each house shall be the judge of the elections, returns, and qualifications of its own members. Effect of failure to reapportion membership on subsequently enacted statute. - The question of whether the failure of the legislature of the Territory, at its first regular session, after the census enumeration was ascertained, to reapportion the membership in the senate and house of representatives, as required by § 55 of the Organic Act, rendered invalid a statute enacted by the legislature subsequent to such requirement becoming effective, was a political question and not justiciable. Each house of the legislature under the Organic Act was the judge of the elections, returns and qualifications of its own members, which power, coupled with the well-recognized independence of the legislative branch of the government, forbade interference by the judiciary with legislative expediency. Territory v. Tam, 36 Haw. 32 (1942). Cited in Harris v. Cooper, 14 Haw. 145 (1902).